Ships in July and offers many new improvements over the original dev kit. 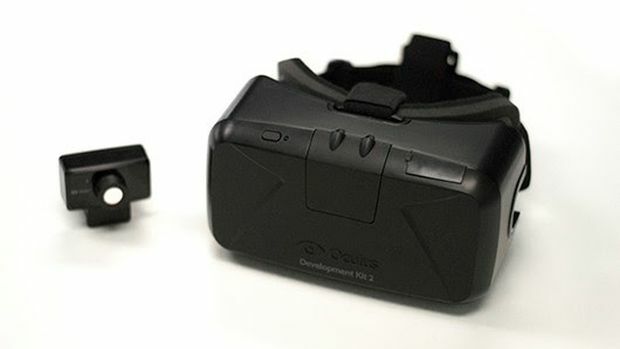 Oculus VR has announced that the Oculus Rift Dev Kit 2 can now be pre-ordered. This second dev kit offers many improvements over the original and will cost $350. This dev kit is due to ship in July and while it isn’t the final commercial product of the device, Oculus VR is getting closer to the ideal design. According to the company, “The second development kit features many of the key technical breakthroughs and core elements of the consumer Rift including a low-persistence, high-definition display and precise, low-latency positional head tracking. “DK2 isn’t identical to the consumer Rift, but the fundamental building blocks for great VR are there. All the content developed using DK2 will work with the consumer Rift. And while the overall experience still needs to improve before it’s consumer-ready, we’re getting closer everyday — DK2 is not the Holodeck yet, but it’s a major step in the right direction. “DK2 features a 1080p display, as well as the Crystal Cove camera with improved head-tracking. It also weighs 440 grams, which make its lighter than the first dev kit. “Like the Crystal Cove prototype, DK2 uses a low persistence OLED display to eliminate motion blur and judder, two of the biggest contributors to simulator sickness. Low persistence also makes the scene appear more visually stable, increasing the potential for presence. The high-definition 960×1080 per-eye display reduces the screen-door effect and improves clarity, color, and contrast. Oculus VR will be facing competition in the field from Sony’s Project Morpheus, which was revealed at GDC 2014 for the PS Move, PS Eye and PS4. On the other hand, Rift will be more focused on PCs and mobiles.